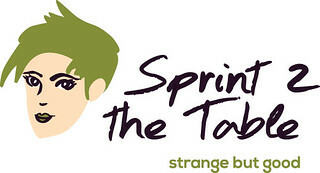 I’ve said before how much I love participating in Strange But Good, hosted by Laura at Sprint 2 The Table. I’m not sure that this really qualifies, but I hate to Not be part of the Party! So here goes. Oh, my Goodness!! I was so excited and was excited to try it for breakfast the next morning. Just as I was getting ready to eat, I thought it might be a good idea to check what it might count for on Weight Watchers. I checked in my trusty food companion and UGH!!! Homemade granola is listed as 8 Points for a HALF cup!!! Ok…I decided I could work with this. 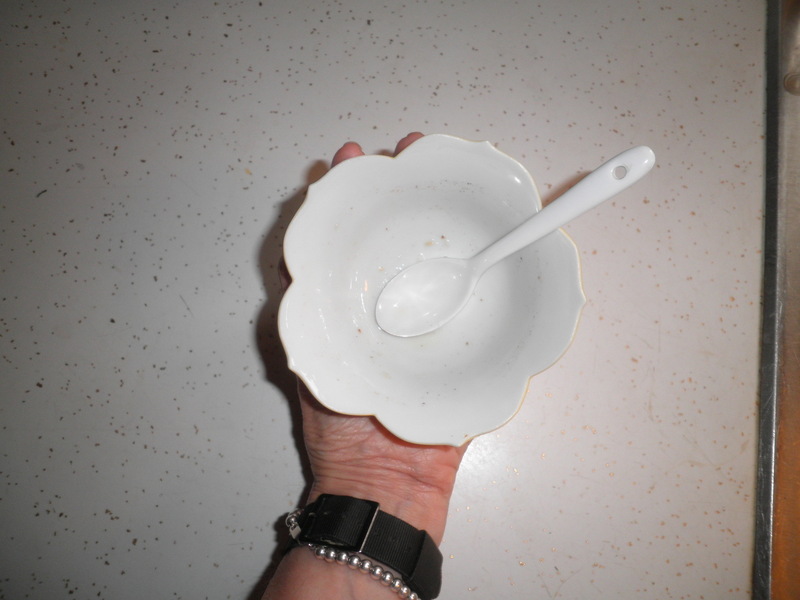 That was actually a quarter cup serving with a quarter cup of soy milk. Cost me 5 Points, but Wow. I ate this at about 7 am and when it was time for lunch at Noon, I almost didn’t want to eat…It was That filling. I decided though that I needed to try to pump it up a bit. I had just bought an overwhelming amount of apples at Aldi because they’re on sale. 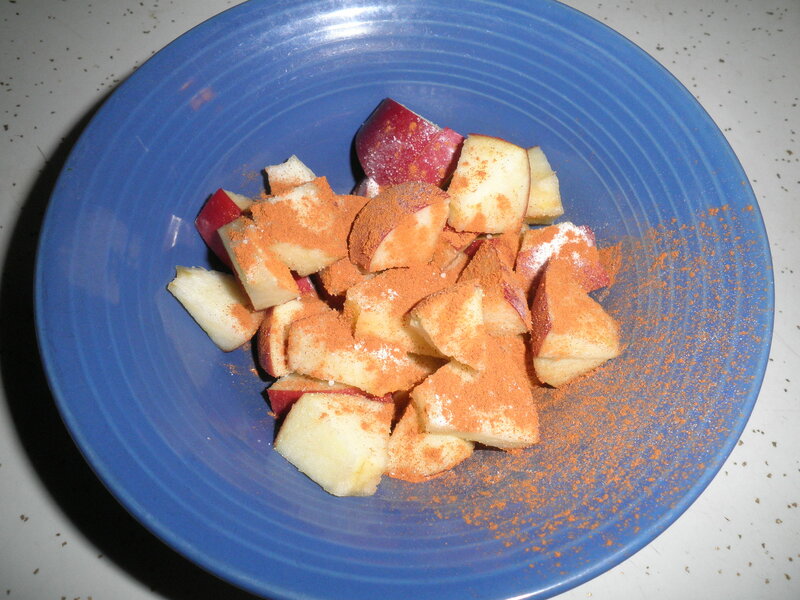 I chopped up a Rome apple, added one packet of Splenda and liberally sprinkled it with cinnamon (of Course!) I microwaved this for 1 minute which softened and warmed it perfectly. 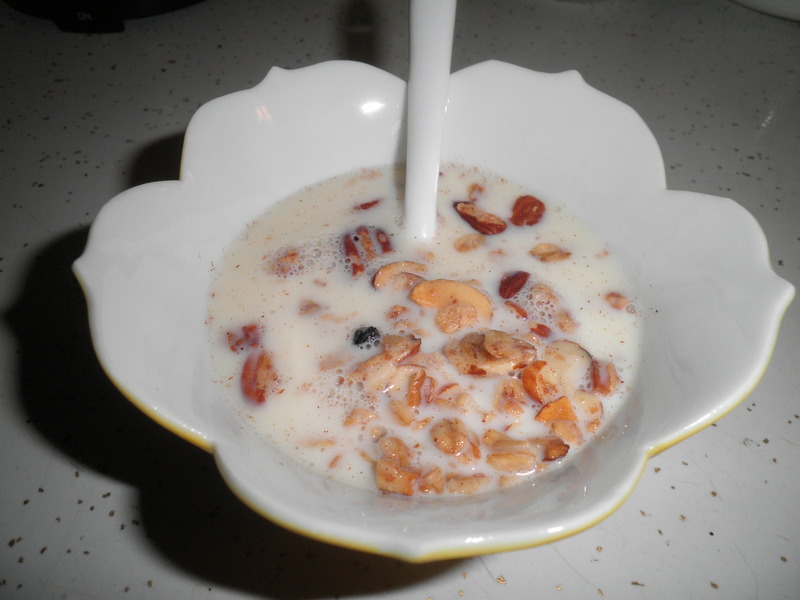 I then added that same quarter cup of granola and quarter cup of soy milk. This was incredible! You can really see in this photo just how wonderful this granola is. I am so happy that I have a lot of the granola and a lot of apples. This is going to be my breakfast for the foreseeable future! It is so good. The best part is that Meghan included the recipe in the package. I have to say that I’m going to try to tweak it to make it a bit more WW friendly, but I will definitely make it. Thanks so much, Meghan for your generosity! You’ll keep my belly full for many days to come. This entry was posted in Uncategorized and tagged Strange But Good, Weight Watchers. Bookmark the permalink. congrats on winning the giveaway, fran! always fun to receive an unexpected treat. ralph’s comment is quite funny! 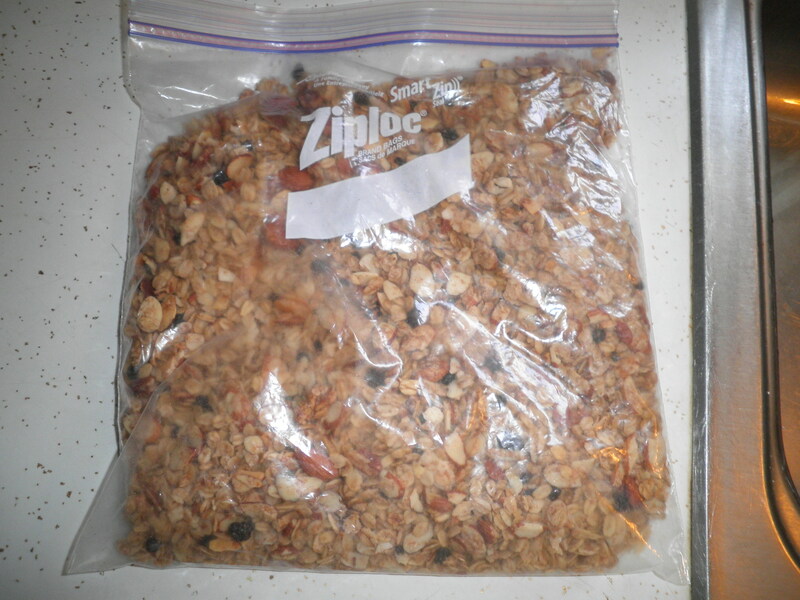 yes, quite unfair how calorically dense granola is…it’s so tasty (quaker harvest crunch, for example). glad you found ways to enjoy and stick to your ww plan! Thanks, Cathy! It’s so go and I can use the basic recipe and lighten it up. Have to work on that. Yes, Ralph is pretty funny sometimes! 😉 Have a great day!! Yum!!! Great way to work it into your diet! It’s too tasty, not to Liz! Have a great day! Hi! Just following the strange but good party..
Hi Missy! Thanks for visiting. I rarely eat granola because of the high calorie count (Point count for me on Weight Watchers) but this was such a wonderful prize, I had to figure ways to eat it. I’m going to make it Last!! Have a fabulous holiday weekend, Fran! Thanks, Laura! Hope you have a wonderful weekend, too!! mm mmm! I love granola. I’m on to a bag of muesli right now, sort of like oats + granola with delicious mix-ins already added. I won a giveaway once for a tiny food cookbook. I was so excited when it came!!! congrats on the victory. Thank you my dear! You’ll have to tell me what brand of muesli you use. I’ve had it before but not for a long time. Usually pretty high in points and I shy away from that. This granola is getting me back into the idea of it though. I’m so glad you got and liked the granola Fran. I usually eat mine with some plain or honey flavored Greek yogurt and fresh berries. 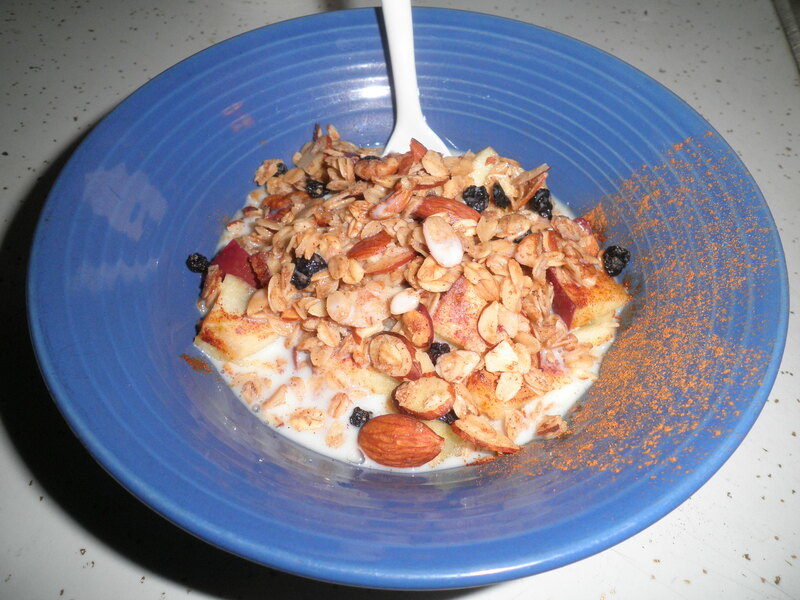 I find the tangy yogurt suits the sweetness of the granola just right. It’s just wonderful, Meghan! Thank you again. As I said…it was higher in points than what I would usually eat, but it was truly Worth It!!! Thanks!